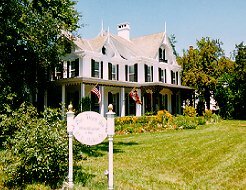 A casually elegant Bed & Breakfast in Snow Hill, this historic village on Maryland's Eastern Shore, with over two acres of lawns and gardens on the scenic Pocomoke River. Close to Atlantic beaches and the Chesapeake Bay, be as active or relaxed as you choose. 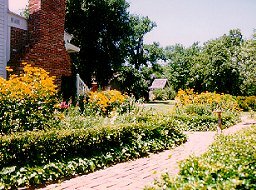 Rated by the American Automobile Association as an excellent ( three diamond) location, the River House Inn offers private baths, queen size beds, private porches, complimentary libations, and good times. The River House Inn is the place for wonderful cycling. Worcester County has over 100 miles of marked cycling trails and roads, the VIEWTRAIL 100. And, there is fabulous canoeing on the Pocomoke River right from your own launching spot at the River House Inn Bed and Breakfast. The Pocomoke is Maryland's first designated Scenic River, renowned for its primitive setting, bald cypress trees and dark waters. Great golf is the norm in Worcester County, with 10 excellent courses within 20 miles of the River House Inn. Good weather 10 months of the year makes it pleasant, and there is awesome Antiquing available for the partner who would rather shop than shoot. Susanne & Larry, along with Belle, Winner and Peaches the poodles, look forward to your visit. Dogs and Children welcomed.